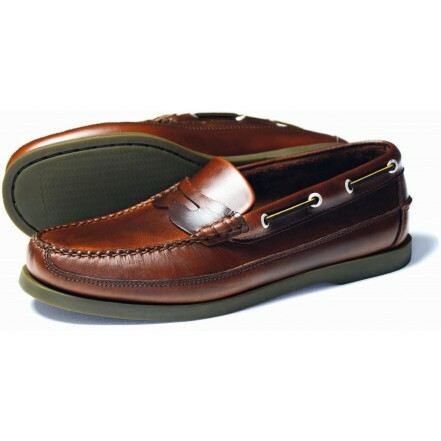 Orca Bay Fripp Gents Leather Loafers are beautifully made from premium, full-grain leather and are ideal for all occasions from Deck to Dock. These stylish loafers are authentic, hand-stitched men&apos;s shoes made in to a deck shoe style with razor cut soles for great traction and salt and rust proof eyelets for durability. A seriously comfortable and highly versatile men&apos;s loafer that look great worn with your summer wardrobe. • Premium full-grain leather for a hardwearing breathable natural shoe. • Deck shoe style loafer. • Razor Cut sole for great traction. • Hand Stitched for an authentic look and long lasting shoe. • Salt and rust proof eyelets for longevity. • Comfortable sole to prevent aching feet.